What will Veterinary Laser Therapy do for my pet? Veterinary Laser Therapy provides a sterile, pain-free, non-invasive, drug-free pain relief treatment for a variety of conditions such as acute injuries, wounds, fractures, neurological conditions, numerous dermatological problems, and pain. Whether your pet is rehabilitating from trauma or injury, healing from wounds, or simply aging, your companion will benefit from this revolutionary new approach to Veterinary medicine. 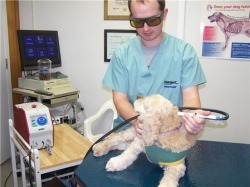 What should I expect during a Veterinary Laser Therapy treatment session for my pet? 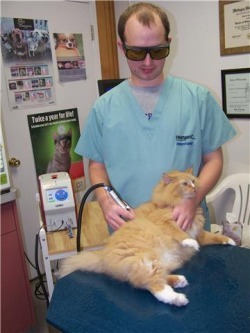 Simply put, Veterinary Laser Therapy provides relief from pain. As the laser is administered, your pet will relax and experience a good massage. Relief almost immediate in most cases, making your pet more comfortable, without experiencing sustained anxiety or trauma. Veterinary Laser Therapy delivers light energy to the tissues of the body, which relieves inflammation, increases blood supply and nutritional elements to the affected tissues while also reducing swelling and pain. Veterinary Laser Therapy is particularly effective in the treatment of arthritis in older pets, acute back injuries, post-surgical therapy and is used on fresh or infected wounds to speed up the healing process. Angry feline companions will start to purr and most canine companions will actually fall asleep during their therapy session. Pain relief is provided in just a few minutes of therapy, improving the quality of life for your best friend. Treatments take about 5 minutes and the laser feels warm on the skin, just like lying on the beach, catching a few rays! 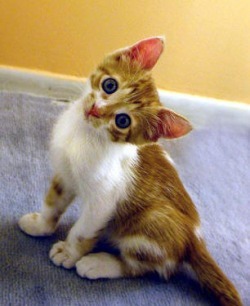 It is a pleasant sensation and most pets experience pain relief in 24 hours or less. Chronic arthritis cases are typically treated 3 times the first week, 2 times the next week and once a week for the following two weeks. Treatments can be repeated at 1 or 2 month intervals if needed. Please contact our laser therapist, Gary, at 532-5539 to schedule a laser therapy session or if you have any questions.